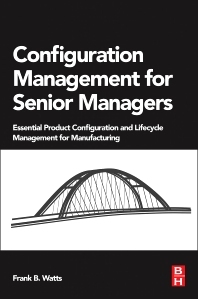 Engineering executives and managers within product manufacturing environments, including project managers, design and development mangers, and quality managers. Consultants and trainers working in related areas. Does Your Request Process Work? Frank Watts has over forty-eight years of industrial and consultation experience as a design engineer, industrial engineer, manufacturing engineer, systems analyst, project manager, and in management. He founded his own specialist configuration management company to provide specific expertise in product release, change control, bills of material and other engineering documentation control issues. Formally a director of engineering services, a director of operations and a director of manufacturing engineering, Watts has worked for Caterpillar, Collins Radio, Control Data, Storage Technology, UFE and Archive. He has guided the development of engineering change control processes at numerous companies and made significant contributions towards improving new product release processes, installing MRP/ERP systems and new numbering systems, as well as helping companies attain a single BOM database and guided reengineering of CM processes. He is an NDIA Certified Configuration and Data Manager, author of several magazine articles and author of the Engineering Documentation Control Handbook and CM Metrics. This is a really good snapshot for upper level management, but from my perspective, you need their support to get things done and accomplished, such as supporting new software, etc... So even though this helps, I think they should really be reading the original CM manual to fully understand all the concepts in order to understand and support the CM person(s) going forward.